In continuing our series, let us now return to our passage of the Lords temptation as we read it in Matt 4. Matthew records this as the second temptation after His time in the wilderness where He was led by the Spirit and fasted for forty days. This time the devil takes Jesus to the pinnacle of the temple in Jerusalem. This location is significant. The temple was a symbol of national pride. 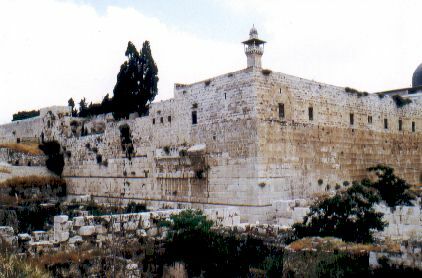 It is the second temple originally built under Zerubbabel leadership, but then significantly extended and re-modelled by King Herod the Great. It was a political and religious centre, and this is the scene for Satan’s next assault. But it was not just at the temple, it was at the top of a pinnacle, that some historians say was 600 feet in height, so much so that if stood on the top, one could hardly see the Kidron Valley below. I will call this here the place of spiritual ascendancy, the dizzy heights of religious power. A very different place than the solitude of the wilderness from where our bridegroom had just come. This is the hustle and bustle of religious ceremony, and if you were to look in the temple courtyard beneath, you would see the money changers and market stalls. Our scene is almost set, but there is one more detail to add. Rabbinic writings foretell that when the Messiah comes, He will be seen standing on the heights of the temple roof. So now let’s see how the battle between Satan and our Bridegroom unfolds. First of all, Satan misquoted Ps 91. He doesn’t quote all of it but takes out a select passage and thereby changed the context and therefore the meaning of the verses. Remember this principle: Truth out of context is no longer truth. Jesus demonstrated correctly how to respond to such an assault, he interpreted scripture with scripture, and responded saying, “again” (meaning, on the other hand) it is written, “Do not put the Lord your God to the test” Matt 4:7. This assault like the first in the wilderness was an appeal to His identity. “If you are the Son of God”. Note that this wasn’t the case on the third temptation which was yet to come, by then Jesus had proven who He was by not turning the stones into bread, and His complete trust in His Father, that He had no need to jump from the temple heights in order to prove who He was or to test His belief and confidence in sovereign protection. To do so would prove the opposite, that He wasn’t the Son of God. Let me paraphrase what Satan was saying, “If you are the Son of God, this is your opportunity to prove who you are. I have brought you to the highest point of the temple, where everyone knows the Messiah will stand when he comes, throw yourself down, and show yourself to the world”. And now here’s the wicked motive behind this assault: To enforce the same outcome that Satan himself faced, when he tested God, and the Bible describes how Jesus saw Satan fall from heaven like lightning Luke 10:18. This was an attack against the Son of God, for Satan to bring Jesus down, to fall from a great height in the way that he himself had done. Now let’s see how the decisive victory was won. Soon after this trial in John 2 just after the wedding in Cana, Jesus returned to this temple, and this time drove out the money changers and merchants. When asked by the Jews on what authority he drove them out, His reply was “destroy this temple and I will raise it up again in three days”. John 2:19 And the disciples later realised that Jesus was referring to His own body. So here in this second temptation, we have the One who is the temple, standing on man’s construction of a temple, and Satan appeals to Jesus to throw himself down from man’s temple heights. Do you see the parallel? It wasn’t Jesus time to die, not this way and not on Satan’s terms, oh no, but the time would come, when this true temple would die. But he wasn’t going to throw his life down in some reckless abandon, instead he chose to lay it down. A decisive act of total love, a demonstration of his life and willingness to pay whatever price was necessary to redeem His bride. In addition, His sacrifice wasn’t going to be in the public arena, for He was crucified outside the city walls of Jerusalem, and where he made his final preparation was not before men, but alone with His Father in the garden of Gethsemane, and drops of blood, like tears of fragrant myrrh sweat from His brow. And unlike the second temple of Herod, which was destroyed in AD70 and has yet to be rebuilt, Jesus rose again on the third day, and through this demonstrated that He was indeed the Son of God. Powerful, brilliant and undeniable. How Satan was no match for our Bridegroom. Tomorrow, we will look at how this second temptation of Jesus provide invaluable lessons for the Bride in her preparation and overcoming her adversary. Maranatha.